This is a moist and delicious cake! It is fantastic on its own, so I didn’t want to make a heavy frosting. A simple drizzle of condensed milk on top was the perfect touch for this Banana, Coconut and Pineapple Cake. This cake is very simple to make and as you know, I am not a good baker, so trust me when I tell you it is easy and simple 🙂 I always have ripe bananas at my house and I hate to waste them, so I decided to create this cake and to my surprise it was wonderful. We loved it! Cream butter and sugar. Add eggs, flour, baking powder, baking soda, coconut milk and cinnamon . Stir in pineapple and bananas and mix well with a wooden spoon. Pour into prepared pan. Bake for 40 to 45 minutes or until toothpick inserted in center comes out clean. Cool cake in pan for 10 minutes, then turn out onto wire rack to cool completely. Drizzle condensed milk and serve. How long does this cake to cool. Yes, since the sun has come out in the past week, I am in the mood for fruity things, and this would work! I am with you on the not being such a great baker. With the luck of the baking gods my stuff works 90 percent of the time, LOL! This is another combination of some of my favorite things. Thank you everyone! I love all your comments! It looks soooo gooood! I like that it has a simple topping! Yummm! Wow, all my favorites all together! The cake looks so moist and also the frosting looks fab! Oh my gosh! It sounds great to me! Love the tropical thing going on with this cake. Wish I had a slice! What a beautiful cake! I make banana and pineapple in ‘Hummingbird Cake’ but it is the coconut that really makes this one special! YUM! Perfect for spring…great combination and gorgeous looking cake. This sounds like a mixture of tropical fruit heaven! Love the three fruits that you used to flavor it. It looks like a great cake! I am bookmarking this as I always need ideas for bananas that are too old to eat and perfect to bake in ! A nice change from the muffins i bake constantly! What a pretty cake! 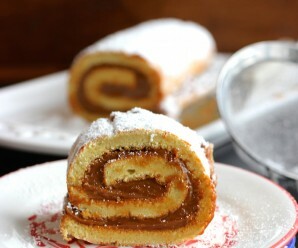 This will be the next recipe I used when I have bananas for baking with! This just sounds like summer with all this wonderful fruit – looks delicious and perfect for paring with tea. This cake makes me homesick, love the tropical flavors! Have never tried the combination of bananas with pineapple but I am sure I will love it. I made this last night at a housewarming and everyone LOVED it…..I am glad that I pre-measured and took the ingrediants with me cause she had nothing for baking lol! definately a hit with the crowd….thanks! Hello erica!! What a divine looking & fresh cake! Yummmmmm,…I so love your appetizing pictures!! oooh yes! 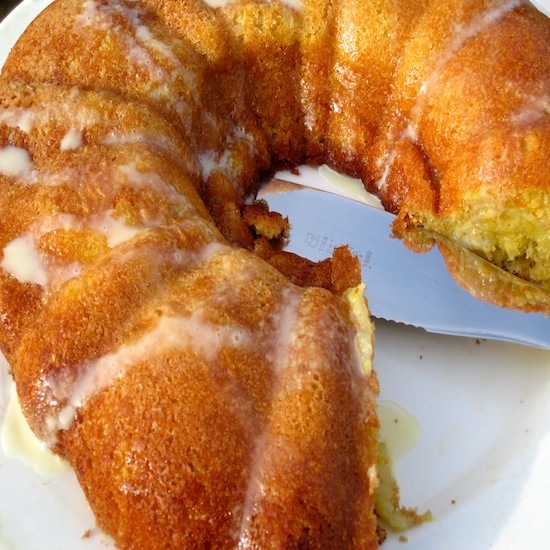 I love banana flavor in a cake but never tried to make it myself. If you say that it’s easy, I will try this one. Yours look so bright and fresh. I just wonder if there is a tip about how to add pineapples in it. I added apple slices once and all of them sank to the bottom! Am I supposed to mash them too? 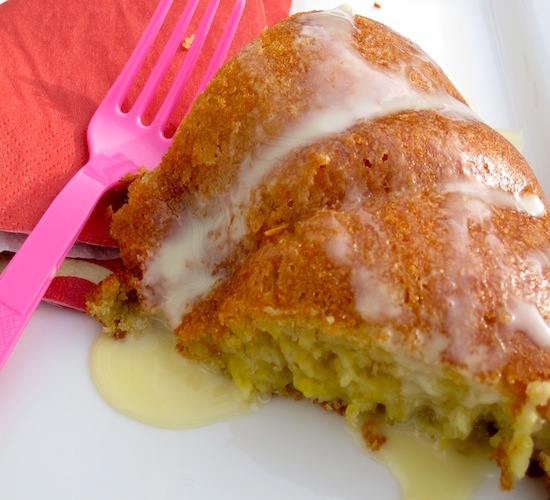 thanks for your comment on the post of the cake recipe I used for my granddaughter’s birthday, used it for “gazillion years”, but it seems this cake (recipe) of yours tops it by far and the condensed milk is such an easy and quick way for a topping! I also love the combination of coconut, pineapple and bananas… have to try it … maybe for my mom’s 80th birthday on Sunday because I decided not to use/make/bake the usual “run of the mill” cakes for this wonderful celebration. BTW, thanks for your visit and comment on my kids party site… hope to see you there again soon! Monica- About 8 to 10 servings. Well, I am trying it right now. I do not have a bundt pan — must be in storage. I hope it comes out well in a cake pan. I will let you know. It came out great with a regular pan. Kim- Thank you for your feedback!! !Glad you liked it. Is the “Coconut milk” sweet or unsweetened? I am learning to cook at 50 and this is the first cake I have ever made that didn’t come out of a box. My husband and friends loved it (after they got over the fear of eating something I had baked). Tasty! And super easy to make. I picked this recipe, not only because of the great reviews, but because I actually had everything I needed to make it in my kitchen! Delish! Did u drained the pineapple or added to the batter directly from the can? I don’t drained the pineapple. This cake is super good and easy to make. Does anyone know how many calories a slice would be? You can use any medium baking pan. Could you give the ingredients in UK measurements? Grams, millilitres or ounces would be fine. I would love to try this recipe but don’t understand cups and sticks? Thanks, Pat! 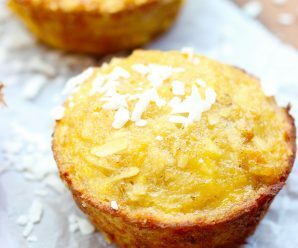 Love the addition of mango and coconut flakes…..sounds delicious! Erica, 1st and foremost I would like to wish you and your recipe followers a wonderful New Year full of blessings. As I type this, I am cooking this recipe, so far just mixing my ingredients, have aromized(making up words as I go along, lol.) my home, I will update on the outcome. Chao…….more , more recipes, all the ones I have tried have come out ricos…. it looks sweet and tastes sooo sweet and i can’t wait to try it.